If you are looking for an outdoor activity for this fall, look no further than Talking Rocks Cavern. This cave is located in Branson West, just about 10 minutes from Silver Dollar City. Talking Rocks Cavern was originally named the “Fairy Cave” by the cave’s original explorer, Truman Powell. Silver Dollar City purchased the cave in 1969 and the name was later changed to Talking Rocks Cavern. This cave is open year round from 9:30-5. According to Talking Rocks Cavern, the cave is vertical in nature, and has concrete handrails and steps throughout the cave. 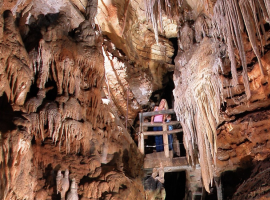 People of all ages go into our cave on a regular basis where they can enjoy the comfortable 62 degree cave air. Guests are able to experience an hour long tour of the cave. Guests will learn about the cave and history as well as important geological information. The cave guides are also prepared to answer any questions that guests may have. Along with exploring the cave and learning lots, there are also numerous activities that guests will enjoy. Guests can play mini golf, pan for gemstones, hike the nature trail, explore the indoor and outdoor SpeleoBox crawl mazes, and have a picnic in the shaded picnic areas. Kids will also love the children’s play area. There is so much to do at Talking Rocks Cavern and guests of all ages will be sure to have a great time!